Your guests will love this unexpected breakfast idea. 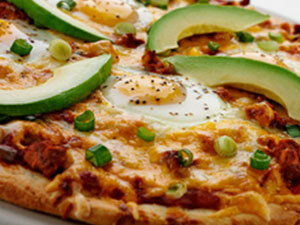 Pizza crust is topped with salsa, chorizo, Wisconsin jack or colby-jack cheese and eggs. To finish, garnish with sliced avocado. Top par-baked crust with salsa, half the green onions and cooked chorizo. Sprinkle cheese over top. Form four small indentations in cheese. Carefully crack one egg into each indentation. Season with salt and pepper. Bake 10 minutes or until cheese starts to brown and egg whites are firm, but yolk is still slightly runny. Garnish with remaining green onions and avocado slices.